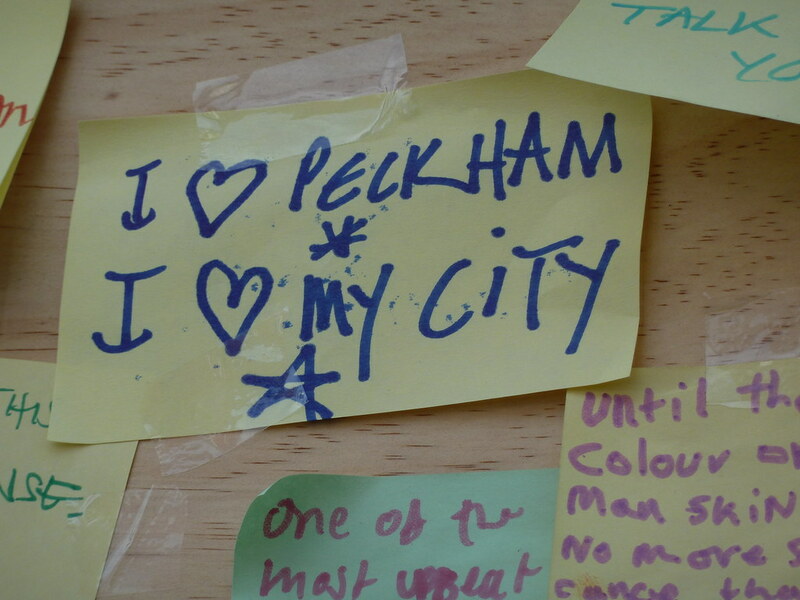 The boarded-up window of Poundland’s Peckham branch has become an emotionally charged bulletin board for locals’ feelings. 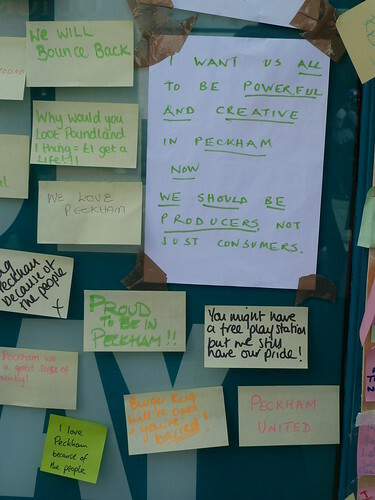 During yesterday’s clean-up from the looting and violence of Monday night (see Guardian live report) in London, the Peckham Shed theatre group * pasted up hand-lettered signs that said: ‘Why we love Peckham,’ (see this Twitpic), inviting passers-by to add sticky notes with their reasons. 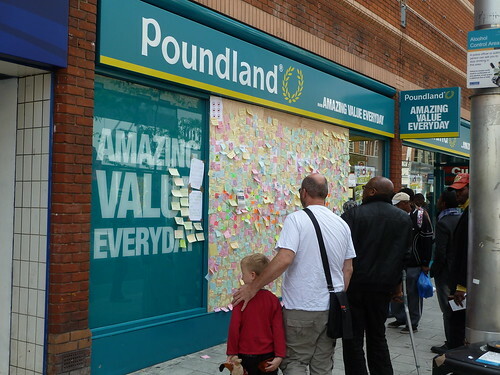 The board, which covered the smashed middle window of the shop in Rye Lane, was soon covered in yellow Post-its, like hand-rendered Tweets on a Peckham hashtag. 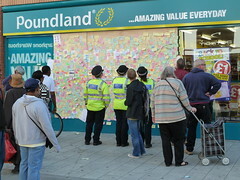 There were brief meditations on the roles of parents, teachers, politicians and the police, plus sardonic reflections on the very idea of looting Poundland, a shop in which every item costs just one pound. 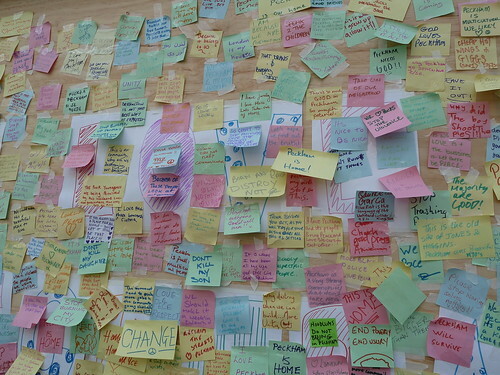 This was another kind of ‘social media’, which drew people in to read the words, chat quietly about the situation and add their own notes. My immediate neighbour was drawn to the A4 sheet saying ‘we should be producers, not just consumers’, on the left of the board. 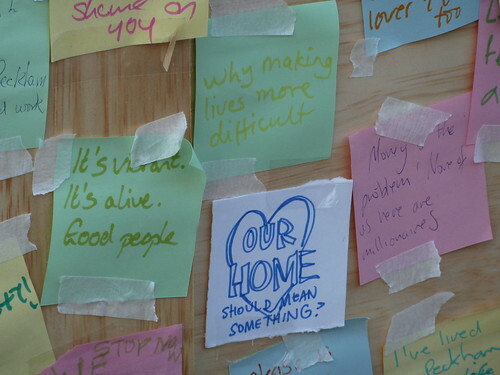 A young woman added a note listing her favourite places, including the cinema, the library, Bar Story and Frank’s, a pop-up bar on the roof of the shopping centre car park. 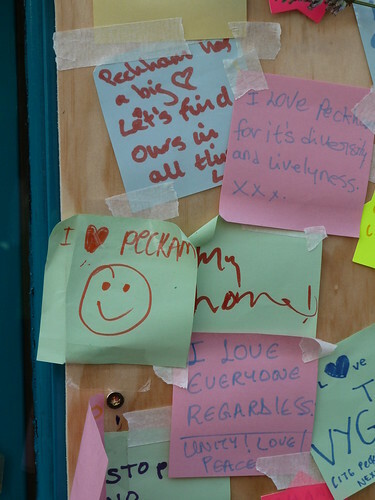 The board won’t be there for long – workmen were already measuring up for a new window – but its emotional content will stay in the minds of everyone who saw it. For the moment, it’s amazing value. 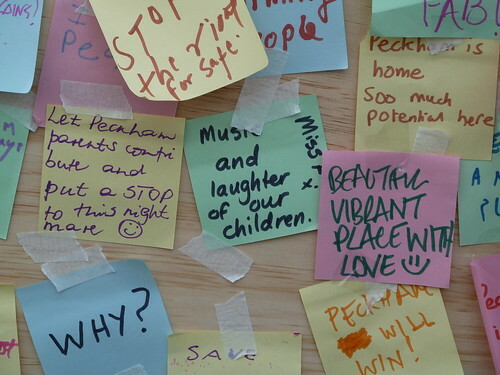 * See ‘Peace Wall in Peckham’ the Peckham Shed theatre group’s account of their intervention. Eye is the world’s most beautiful and collectable graphic design journal, published quarterly for professional designers, students and anyone interested in critical, informed writing about graphic design and visual culture. It’s available from all good design bookshops and online at the Eye shop. For a taste of the current issue, see Eye before you buy on Issuu. Eye 80, Summer 2011, is out now.